Why Does a Word Sometimes Lose All Meaning? It’s a bizarre scourge afflicting editors and writers, casual readers, and pretty much anyone pondering a word for any length of time. Consider the word flower. F-l-o-w-e-r. Flowers. The flower in the field. The flower in the grass. Flower. Flower. Flower. 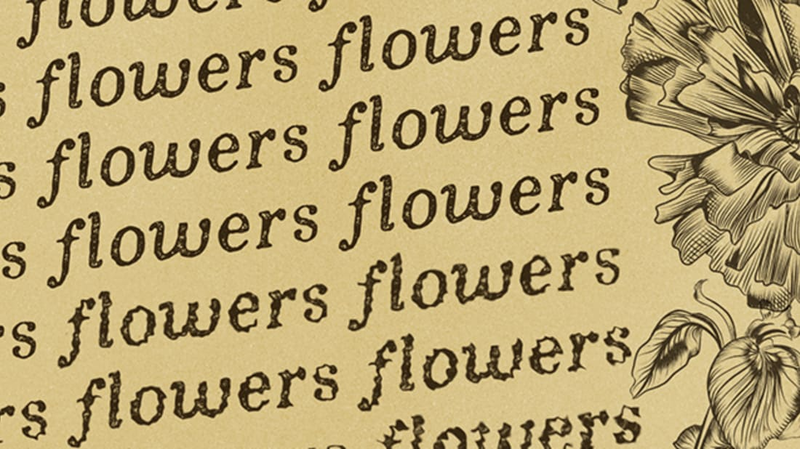 If a printed word is looked at steadily for some little time, it will be found to take on a curiously strange and foreign aspect. This loss of familiarity in its appearance sometimes makes it look like a word in another language, sometimes proceeds further until the word is a mere collection of letters, and occasionally reaches the extreme where the letters themselves look like meaningless marks on the paper. Over the years, this mental literary fail has gone by many names: work decrement, extinction, reminiscence, verbal transformation. But the best known and recognized term is "semantic satiation." Leon James, a professor of psychology at the University of Hawaii’s College of Social Sciences, coined the term in 1962. In James’ doctoral thesis on the subject at McGill University, he conducted a variety of experiments to explore how the concept affects thinking. According to James, any word can fall prey to semantic satiation, but the amount of time before words begin to lose meaning can vary. For example, words that elicit strong dramatic connotations or emotions—think explosion—can seem to lack the satiation effect because your brain focuses on and cycles through other associations with the word, lessening an otherwise speedy pathway to bewilderment. And as the stimulus is presented again and again, you get more resistant to the stimuli. James recalled an early study that presented a sleeping cat with a tone. The cat immediately woke up. But as they played the tone again and again, the cat took a little longer to wake up each time, until it just kept on sleeping. But when the tone was varied slightly, the cat immediately sprung into action. Over the years, James’s work has also showed that semantic satiation is more than just a perplexing plight for readers. One experiment he conducted sought to explore whether semantic satiation could be used to lessen stuttering. James had an assistant call on the phone a study participant who stuttered—creating a situation designed to increase anxiety for the subject because verbal cues and other in-person elements can’t be used to assist communication—and speak for one minute. Ten minutes later, the assistant called again for another minute. The assistant repeated the cycle a total of 10 times throughout the day. James says the goal was to induce semantic satiation in the stuttering participant related to the emotion of the stress-inducing phone call. And he says it worked. James also explored music. He studied pop charts, and found that the songs that came onto the charts fastest—and thus received the most concentrated amount of airtime—were the ones that left the charts altogether the fastest. The songs that slowly climbed the charts to the top position went out just as slowly, fading away versus burning out. But why do we even like to listen to a song more than once? To take a deeper dive into the notion of semantic satiation in music, consider the chorus. As Elizabeth Hellmuth Margulis, director of the Music Cognition Lab at the University of Arkansas, writes on Aeon, semantic satiation plays a key role in song lyrics. Due to the repetition of choruses, the words and phrases become “satiated” and lose their meaning—and no longer really register as words. While James has since turned his attention to such topics as road rage, semantic satiation is still analyzed today across a variety of disciplines. Artists have explored the concept. The curious (but sadly defunct) Semantic Satiation Twitter bot tweeted about it. Marketers are rethinking their sales ploys thanks to the concept. One timely example is “Black Friday Malady.” Thanks to overuse, “Black Friday” is no longer the valuable hook it once was. We’ve repeated it so much that it is now as indistinct as the packages of generic Wal-Mart string cheese that you storm past on your way to brawl over a half-price vegetable steamer at 3 a.m. Yes, the phenomenon is odd. But stranger things have happened. After all, consider that this is a real, grammatically correct sentence: “Buffalo buffalo Buffalo buffalo buffalo buffalo Buffalo buffalo.” Just say it before the semantic satiation kicks in.